As the fifth entry in this series opens, Swedish police detective Kurt Wallander is looking forward to his upcoming vacation, but then he answers a call to a farmer's field where a young girl has been standing all day in what appears to be a catatonic state. Just as Wallander arrives, the girl douses herself in gasoline and burns herself to death. Wallander is naturally horrified and cannot imagine why the girl would have chosen to end her life, especially in such a painful manner. His task now is to identify the young woman and notify her family of her fate. This will prove to be a difficult process. Shortly after the girl's death a retired Swedish Minister of Justice is murdered by someone who smashes his head with an ax and then takes his scalp. Wallander and his team are on the case, but have no obvious suspects. For the remainder of the book, the P.O.V. 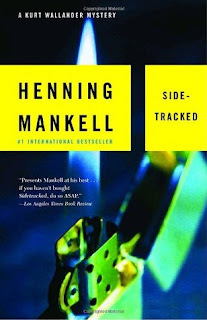 switches back and forth between Wallander and the killer who is on a mission that becomes clearer as the book progresses. As it does, a couple more men will be murdered and scalped and it becomes pretty clear that neither Wallander nor anyone else on his team will be going on vacation anytime soon. This is another very intriguing and entertaining entry in the series and, as always, it allows Mankell to make observations about a number of social issues. There are a number of troubled families in this book, for example, including Wallander's own. His difficult relationship with his daughter, Linda, has significantly improved, but his father is slowly sinking into dementia and Wallander realizes that they will have little time to repair their fragile relationship. The plot is compelling and moves along swiftly; as always the characters are very interesting, and all in all, this is a book that should appeal to large numbers of crime fiction fans.